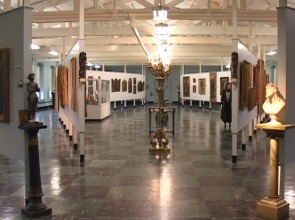 The museum has no professional cooling system to preserve the well over 100 pieces of art work. Do you want to stand two feet away from a piece of cloth that Mary, the mother of Jesus, supposedly touched? If you answered in the affirmative, then you might want to visit the Shrine of the Miraculous Medal. The shrine is located at 500 E. Chelten Ave., in a residential area, just steps away from the Germantown SEPTA stop. “This is the only U.S. location where you’ll find anything that Mary has touched,” said Lizanne Pando, the director of communications for The Shrine of the Miraculous Medal. Looking away from the piece of cloth that is next to a replica of the chair from which it came, you’ll discover what has been called the “undiscovered gem” of Philadelphia by some visiting the church. “My friend has called it the UN of prayer,” Pando said. Scouring the crowd of the church on a Monday novena, it’s rather difficult to disagree with her. The church is packed anytime you go there for a novena, filled up to the last pew of the church. The churchgoers range from infants to the elderly of all ethnic groups. During mass, everyone has their own method of prayer, whether it’s taking time out to say a prayer in the shrine of the church or to write a petition and put it in a statue of Mary and Jesus. So why are they all flocking to this shrine? “It all began with St. Catherine Laboure,” Pando said. It’s believed by Catholics that Laboure saw Mary and was ultimately asked to have a medal be struck. “Just as you see in front of you,” Pando added. The medal is usually worn as a sign of faith in Mary and in God. Pando pointed out that the shrine’s focus on Mary might confuse others. But she explained that people shouldn’t confuse the focus that they put on Mary with the one they put on God. “We don’t worship her, we worship God,” Pando said. She continued that believers simply think that Mary helps bring more attention to their prayers because of her relationship with Jesus. Rev. William Allegretto, a Vincentian priest at the church, noted that a lot of non-Christians visit the shrine as well and show an interest in Mary. Monday novenas, as Pando explained, are usually packed. The number of attendees during the course of a week has grown over the past couple years to somewhere between 850 and 1,250 people. This might come as a surprise considering that the archdiocese of Philadelphia has been having attendance problems, which has resulted in the closing of churches and schools. But the novena begins a bit differently than at most churches. Every week a priest reads from a piece of paper. Some of the notes include statements such as “I have been unemployed for 21 months and I just received a job.” While others are thankful for their sons returning home from Afghanistan. “We get these little notes of favors and miracles that have been provided,” Pando said. But the irony of this setting is that the packed house at the shrine doesn't translate into people visiting the art museum that is associated with the shrine. The museum stands just a block away without any major signs announcing its existence. In fact, you won’t find any advertisements for it anywhere. Yet its collection of religious pieces ranges from 15th century China to papal robes from the 1930s. It has a wide breadth of collections from monuments to paintings. The museum also houses a small chapel in the very back. Rev. Joseph Skelly, the founder of the church and an art aficionado, helped all of this artwork find a home. The artwork had been collected in Rome through donations or as gifts from fellow Vincentians. “Where in the world would [they] put it? So [Skelly] told them to send it to him and then he’d put it all together,” Pando explained. The space itself is neglected. It has no professional cooling system to preserve the well over 100 pieces of art. Some of the pieces need professional renovation, which comes at a hefty price. Yet the space stands empty, craving attention. “We love the museum but without staff or funds,” Pando explained that it’s just too hard to manage the museum as is. However, it’s open to the public by appointment. If you’re a Philadelphian who hasn’t heard of this place, you’re not alone. Pando is a bit discouraged when it comes to the shrine’s museum. She would love to have art classes come and take advantage of the artwork there. As she walked through it, she presented ideas of how the space could be used--aside from just being visited. She explained that the Vincentians see two choices. You either use the estimated $15 million needed to renovate and operate the art museum. Or, you can use the money for the soup kitchen to help feed the poor and homeless. For the Vincentians, the poor outweigh a museum--even if it does mean attracting more prosperous donors for the shrine, Pando added. “They’re really missionaries," she said. The Vincentians don’t just feed the poor, they help former prisoners reenter society. “They just let them out of prison, without a dime. How are they supposed to get back into society? What are they supposed to do?” Pando asked. She explained that the Vincentians also have programs that dedicate money toward programs like helping former prisoners find a new apartment. For now the shrine has been expanding its services to help educate other Catholics about Mary’s role in their religion. Pando explained that many Catholic schools have been cutting curricula about Mary in order to accommodate other subjects. As a result, the shrine has embarked on a new program by developing a new curriculum just about Mary. “We’re in the process of launching this program,” Pando added. The program includes videos about the shrine in the package and a curriculum for schools to follow. In a place of miracles and faith, Pando will just have to keep her faith that something will work out with the museum. “It’ll happen when it’s meant to,” Pando said. This article was written and reported by Anna Berezowska and Genevieve LeMay for Philadelphia Neighborhoods, a publication of Temple University's Multimedia Urban Reporting Lab, and originally published on April 10, 2011.